THIS WEEK, WE’RE offering another scene pulled from a collection of billboard subjects recorded between the late 1920s and the early 1940s. The photography by Foster and Kleiser of its Seattle-based billboards began near the start of the Great Depression and ended when preoccupation with World War II was fresh and alarming. The company’s photographer has included three billboards in her or his negative taken from the east curb of 15th Avenue Northwest and about 20 yards south of Northwest 64th Street. The billboard at the center on the north side of the arterial Northwest 65th Street tempts every motorist heading north on 15th Avenue Northwest with a dream of conspicuous consumption. Despite the Depression, the billboard flaunts a luxurious Lincoln-Zephyr V-12. That 1937 Lincoln reminds me how I was puzzled as a youngster that car companies were permitted to sell automobiles that were newer than new. (The cars they sold were often dated for the coming year.) Now I also wonder whether it is possible that Seattle’s Lincoln dealers did some “spot advertising” and paid extra for this head-on location, because a good fraction of Seattle’s most-wealthy 1 percent commuted via 15th Avenue Northwest to homes in the gated Highlands. This billboard negative was exposed on Nov. 1, 1936. On that day, The Seattle Times noted, “Thousands of hunters are swarming into Eastern Washington for the opening of the deer season.” Even more affecting, it was two days before the country would extend Franklin Delano Roosevelt into his second term as president. He won 60.8 percent of the popular vote and 98.49 percent of the electoral votes, the highest percentage of any candidate since 1820, when James Monroe, the last candidate of the Revolutionary generation, faced no major opponent. 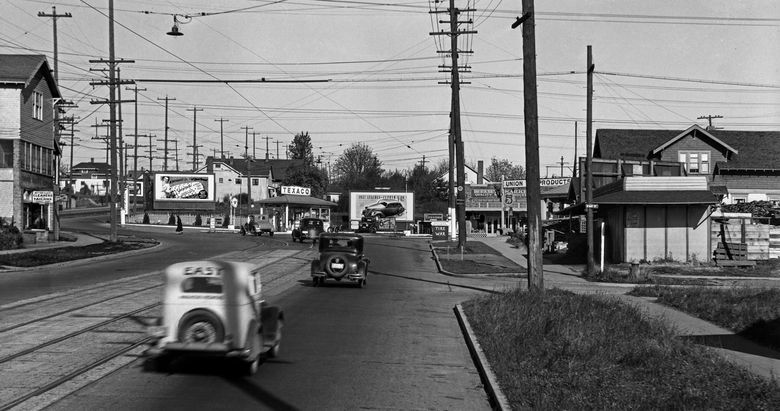 Returning to the pavement: The odd kink in the grid at 15th Avenue Northwest and Northwest 65th Street was the gift of Ballard’s early development with additions. 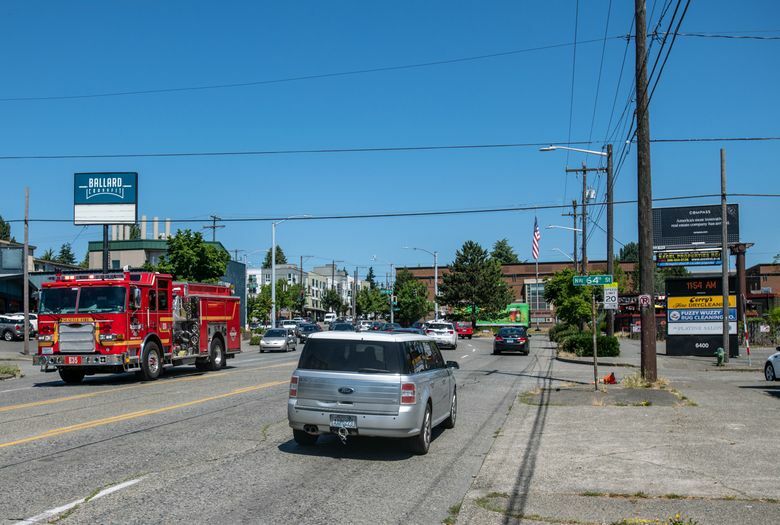 I remember that while I was visiting friends in Ballard during the early 1980s, the city’s Department of Transportation, after tabulating the crashes, promoted this as Seattle’s “most dangerous intersection.” Slow down, and take care.